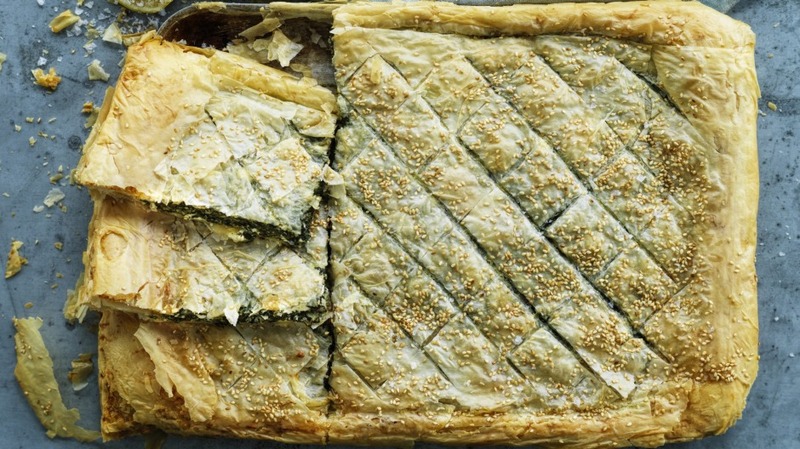 Spanakopita might not be the quickest, throw-it-together-at-the-end-of-the-day dish, but if you have a bit of extra time and want to make something delicious, nutritious, satisfying, good for a crowd, and vegetarian, this is it. Sure, you could buy frozen chopped spinach for the filling but using fresh greens is so much better and worth the effort. 1. Thaw filo pastry, if using frozen, but leave in the fridge until ready to use. 2. Melt the butter and set aside. 3. Wash all the greens, discarding any thick stems and roughly chopping leaves. Set aside. 4. Choose your widest saute pan, heat oil over low-medium heat and saute the onion and garlic. Add one teaspoon salt and cook low and slow until onion and garlic are completely soft with no colour. Then add the parsley and dill and gently saute for 30 seconds. 5. Next, add the greens. There might be too much for the pan so add half, allow that to wilt, then add the rest. Add the remaining one teaspoon salt and cook until the greens are completely soft and most of the liquid has evaporated. Dump the greens into a colander set over a larger bowl and drain off any excess liquid. 6. While the greens cool, preheat oven to 180C (160C fan-forced). 7. Once the greens have cooled, press them to remove any remaining liquid. Roughly chop the cooked greens on a chopping board and scoop into a large mixing bowl. 8. Add eggs, feta, ricotta and nutmeg to the bowl and mix well with a spoon to evenly distribute everything. Set aside. 9. Using a pastry brush, brush the bottom of a sheet tray with melted butter. Try to choose a pan about the same size as the filo sheets with low sides. Sheet trays are perfect as low sides mean more moisture can escape and you get a crisper bottom. 10. Add one sheet of filo pastry and brush with melted butter. Repeat this process 10 times with butter between each layer. If the dough tears or breaks, piece it back together – you won't notice in the finished product. 11. After 10 layers, spread the greens and cheese mixture on top, almost to the edges but leave a one-centimetre gap around the sides. Press filling down gently. 12. Add a layer of pastry and brush with butter, scatter 1 tablespoon grated parmesan on top. Add another sheet of filo, brush with butter and add the rest of the parmesan. Add the final layer of pastry and gently press everything down. 13. Finally brush the top with butter and sprinkle with sesame seeds if you like. Score the top two layers into serving-sized diamonds or squares. 14. Bake for 25 minutes, or until the top is golden and crisp. Remove from oven and allow to cool to just warm before slicing and serving. Find more of Danielle Alvarez's recipes in the Good Food Favourite Recipes cookbook.